Sainey Manneh, the son of a renowned player has since established himself and has proven to coaches that his long stay in the academy is really because of his hard work and ability to do what the academy is proud off. Sainey Manneh has the ability to play in defence, midfield and attack due to his height and skill. 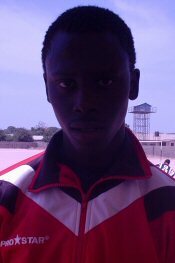 When playing in defence, he is admired by all and sundry including the junior players in the academy. As a central defender, Sainey’s qualities includes coordinating the defence, good aerial battler, strong on ad off the ball as well as accurate and precise ball passer. His qualities also include disposing his opponents from the ball and do rarely commit few fouls and most of all a team player. Coupled with his academic pursuit sainey Manneh has combined the two as he has continued to win the hearts of coaches during training and matches. Of recent, he played well in the national zonal championship as few of the youngest players to future in that championship. His laurels include captaining the village’s third division team that emerged runner up in the third division league. This is what earned him a place in Hawks’ youth team from 2007-08 and eventually the senior team. He is likely to feature in this year’s first division.